Hello everyone! I hope everyone is having a great weekend. It seems like the weeks are just flying by. Today I would like to share a couple of wedding cards that I made as a request from a friend. I chose to keep these clean and simple and I strived for an elegant look. I sure hope I succeeded. I chose to case this card from here. 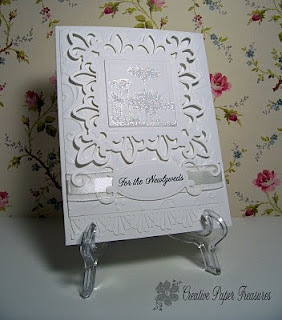 I saw this card on Split Coast Stampers and thought it was so clean and elegant. 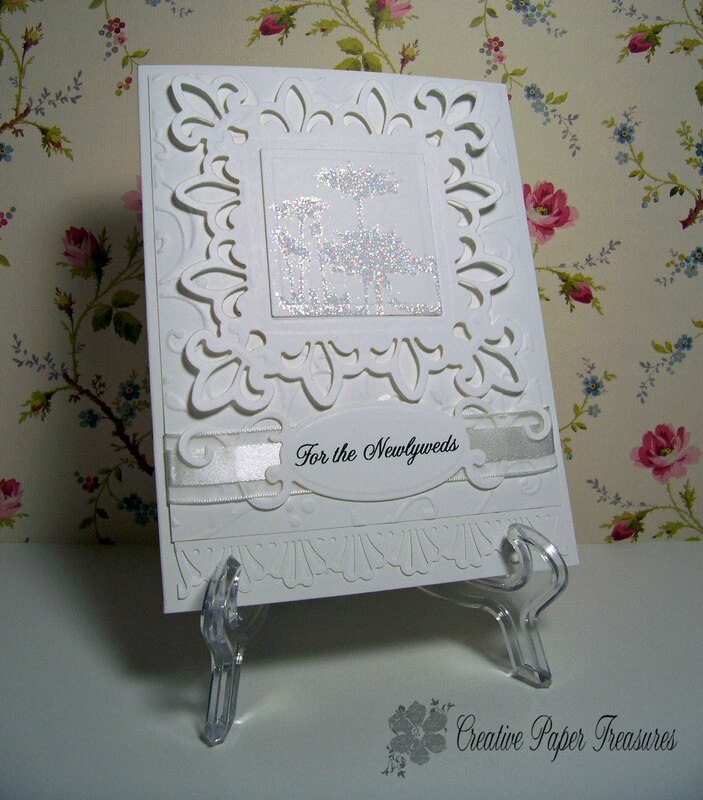 The image is embossed with SU heat and stick powder then sprinkled with dazzling diamonds glitter and heat set again. It is really very pretty in real life. This next card is cased from here. I changed the orientation of the card and used a different embossing folder and ribbon. I didn't have a Stampin Up wedding stamp so I had to used one I purchased before signing as a Demo. 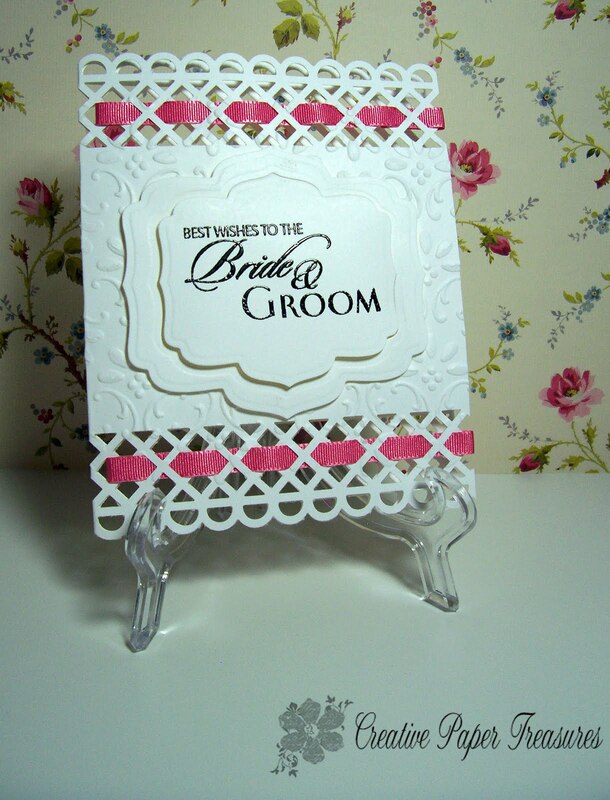 Accessories: Spellbinders die, MS lattice punch, SU finial press EF, ribbon from stash, black embossing powder. I hope you like my projects today and these cards gets those creative juices flowing. Have a great day! Diane, I love both of your cards, but my favorite one is the all white one! It is beyond gorgeous, gf! So very classy!!!! I love this! Great colors and framing. 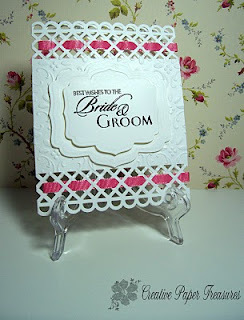 I love the weaved ribbon in the lattice. Diane, You definitely achieved elegant on that white card! Both of them are very pretty, but the white one is my favorite.